Termination: Solder tags. 10 mm x 3.17 mm tin plated nickel strip protrudes. Replaces: Varta LIC 18500-14 C, Molicell ICR-18500-H, Molicell ICR-18500-J, LG Chemical CR18500, LC18500, Panasonic CGR18500, and others. 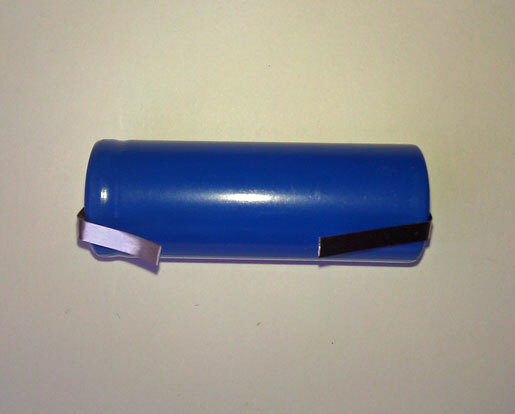 The cylindrical LIR-18500-FT Lithium-Ion cell is a popular size of lithium-ion cells ('18' denotes the diameter and '500' the length in millimetres and tenth's of a millimetre respectively). Our LIR-18500-FT cells are ideal for battery pack builders, computer laptop repairs, 7.4 volt remote controlled (RC) car battery packs etc. Our LIR-18500-FT cells have been successfully used to replace exhausted cells in several Philips Norelco and Braun shavers. For example it fits Philips Norelco models HQ8894 Sensotec Shaver, 8892XL, 8894XL, 8895XL, 9160XL, 9170XL, 9190XL, 9195XL, 9170XLCC, HQ9190CC, HQ9140 SmartTouch XL Shaver, HQ9170, HQ9160 and HQ9100. Also fits Braun models/types: 720, 760, 790, 760CC, 790CC, 799CC, 5671, 5673, 5675, 9565, 9585, 9585CC, 9785, 9595CC and 9795. The Phillips shaver Smart Touch XL-HQ9170 has a battery with the markings "SF US18500VR TR1.1.1.1 00H081" which can be replaced by this battery. The lithium-ion technology used in these cylindrical LIR-18500-FT cell is light-weight and high voltage. It results in significantly higher energy density than NiCd and NiMH batteries. The lithium-ion technology used in these cylindrical LIR-18500-FT cell has no 'memory-effect'. This LIR-18500-FT requires the use of protection circuitry to keep the battery from over-charging, over-discharging, or over-heating. You will require knowledge of how to safely charge Li-ion cells. Failure to treat the cell correctly may cause it to become hot, explode or ignite. We cannot be held responsible for damage or injury caused by misuse of Li-Ion batteries.